Following the eruption of the Eyjafjallajokull volcano in Iceland, weather patterns - for the time being - continue to blow volcanic ash towards the UK. Dr Kathryn Goodenough, a geologist at the British Geological Survey explained that the eruption had not re-intensified, "it's just a change in the weather - a low pressure system associated with southerly winds - that has led to talk of a 'new' ash cloud". Nats, the UK's air traffic control authority described the current situation as "dynamic and rapidly changing". According to current European regulations, no matter how low the concentration of ash, no commercial aircraft should fly as long as it is in its path. A statement from Nats said that there was "no threshold" for concentrations at which volcanic ash was acceptable. The dust is simply too dangerous for jet engines to risk commercial flights encountering it, said Nats. 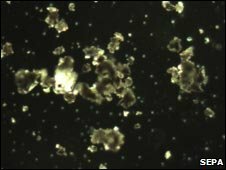 If volcanic ash particles are ingested into a jet engine, they accumulate and clog it with molten glass, which can cause the engine to shut down. Because of this, the International Civil Aviation Organization (ICAO), which operates the International Airways Volcano Watch system, recommends implementing a no-fly zone if volcanic ash is detectable in airspace. Aviation consultant, Chris Yates explained: "The ICAO regulation that has prompted this widespread grounding is from experience gained from over 80 incidents between 1980 and 2000 [as well as] computer modelling and best 'guestimate'." But the current paralysis of UK and European air traffic is unprecedented, so the regulations may have to be changed in order to get things moving. "The airline industry... are clearly making the argument that we are being over cautious in grounding all flights," said Mr Yates. "Whilst it remains possible to find clear air up above us this doesn't necessarily mean that there are no pockets of high concentrations of ash at the various flight levels. I would suggest it's better to err on the side of caution." But the European Commission has now intervened to organise a meeting on Friday between technical and safety experts to find out if there are other options, such as setting up a fly zone that would allow carriers to navigate around the plume. Policy-makers have stressed that any decision must be based on a scientific assessment of where and when it is safe to fly. Weather may still intervene: An area of low pressure is developing in the Atlantic. By Friday or Saturday, it will have pushed towards the UK causing the current north-easterly winds to change to a south-westerly direction. The Scottish Environment Protection Agency has analysed the offending dust, very low concentrations of which has reached ground level in the far north of the UK. The agency expect there to be "minimal risk to the environment" from the dust particles, which are essentially very fine shards of volcanic glass. Volcanic ash under a microscope, magnified about 100 times. John Maclennan, an Earth scientist from the University of Cambridge, explained that most of the particles were between 10 and 200 micrometres in across. "The particles in talcum powder, for example are about 10 micrometres across, and the sand on fine sandpaper is about 200 microns across," he told BBC News. "The ash from Eyjafjallajokull is relatively rich in silica for an Icelandic eruption, which, combined with its eruption under [the ice sheet], leads to powerful explosions and the possibility of generating so much fine ash and lofting it high into the atmosphere." And because this dust is so fine, it could enter and clog the tiniest hole or vent in a jet engine. Dr Colin Brown, director of engineering from the Institute of Mechanical Engineers, explained that the composition of the dust also meant that it would melt when it reached very high temperatures. "Modern jet engines operate well in excess of the melting point of this rock," he said. 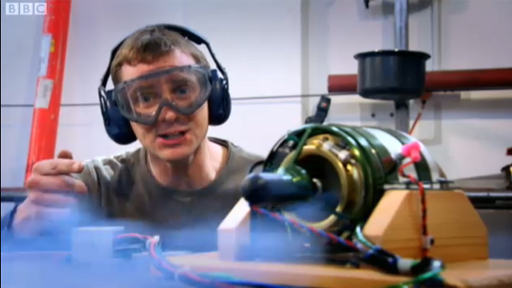 "They rely on having air cooling to keep the metal in the engine from melting. If you block off that air cooling, the metal melts and the engine melts." 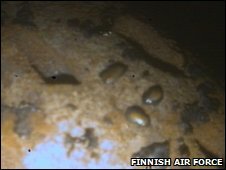 The turbine of a Finnish fighter jet engine had droplets on its surface. The Finnish Air Force reported damage to the engines of several of its fighter jets, which had been flown in short training missions over Northern Finland when the airspace was still open to traffic on the morning of Thursday 15 April. "A post-landing inspection [with cameras placed inside the engines] revealed accumulations of powdery volcanic dust in the aircraft's air intakes," said the air force. "Images show that ingested ash has melted under the extremely high temperatures. "[This] indicated that even a short-duration flight inside an ash cloud may cause substantial damage to aircraft engines." There have been reports from Germany that airlines, including Lufthansa have been given special permission to fly at lower altitudes - underneath the cloud. But Nats explained that reinstating air traffic control under the cloud would not be feasible, either pragmatically or legally. "It's not our airspace and we can't just co-opt it even in this situation," said a Nats spokesperson. And there is no radar coverage below the level of controlled airspace. "If aircraft are flying outside of controlled airspace, they're flying on VFR (Visual Flight Rules) so the onus is on the pilot to make sure he's not going to fly into another aircraft," explained Nats. The authority also pointed out that for flights over populated areas, higher altitude means a greater safety margin. From the UK, the Met office is using satellite imaging and lidar (a type of radar) measurements from the ground, as well as consulting satellite images, to measure the cloud and to forecast its movement. And scientists are now cautiously optimistic that the release of volcanic ash could finally be on the wane. Webcam images captured early on Friday morning showed a change in the character of the eruption at Eyjafjallajokull. Dr John Murray, an Earth scientist from the Open University in Milton Keynes, said that the ash had "significantly diminished" and the ice over the crater itself had melted. "This is the stage we have been waiting for: the steam explosions due to water being trapped within the erupting lava will have virtually ceased, and the activity has changed to lava outpouring," he said. "Ash may resume at any time, but it is likely to be less pronounced and prolonged than before." 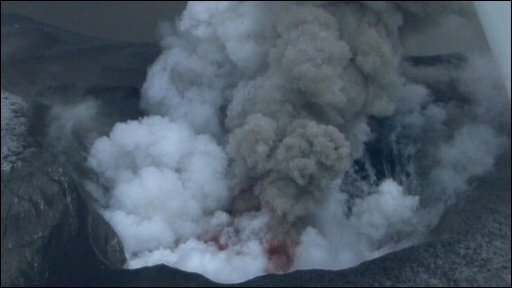 But Dr Sue Loughlin from the British Geological Survey pointed out that a decrease in the volcano's activity might not mean the end of the eruption all together. "There's seismic activity ongoing, which means the eruption is ongoing," she told BBC News. And, according to the Icelandic Met Office, there was an increase in the size of the tremors on Sunday. "This quietening of the volcano is quite normal activity in the middle of an eruption. We tend to follow a rule that if there's no sign of any seismic activity for three months, then that's the end of an eruption." Another primary concern, Dr Loughlin added, was that a nearby volcano called Katla might also erupt. "These two volcanoes are right next to each other, and three out of four previous eruptions of Eyjafjallajokull have been associated with eruptions at Katla," she told BBC News. "Katla is a much bigger volcano and has a much larger ice cap. It is thought to have a large magma chamber at a very shallow depth, so it has the potential to be very explosive and release a large amount of ash." And scientists say that the UK has been fortunate to have avoided this situation for so long. Iceland has about 130 volcanic mountains, of which 18 have erupted since the settlement of Iceland, around 900AD. But this is the first time that this type of event has encountered modern aviation. Future eruptions could cause similar disruption. For the time being, aviation authorities await a guarantee that skies are clear of ash or for news that a more immediate solution has been arrived at.